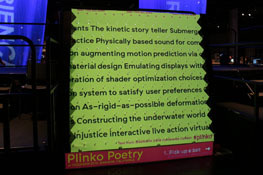 Plinko Poetry is an interactive installation that allows users to create blackout poetry using SIGGRAPH submission headlines. The interface removes words from their original context to become a playful and satirical reminder of their meaning. Players release a ball at the top of the screen and transparent pegs randomize the path of the falling ball. Once the ball goes across a line of words, that line is frozen and a selected word is highlighted by blacking out adjacent words on the same line. When the ball reaches the bottom, all selected words are assembled together as a poem and printed as a souvenir. Player drops a ball from the top of the screen to create blackout poetry. Close-up view of screen and frame for Plinko Poetry.